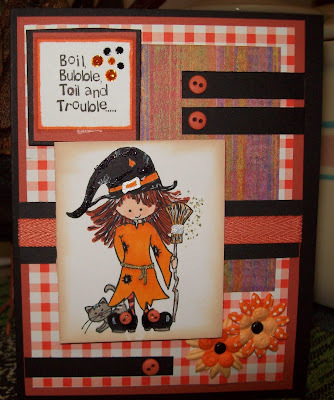 Here we are again with another Halloween card using the little witch from Stamping Bella. This layout was posted on Kristine B (Oregon) blog http://www.inksomething.blogspot.com/ . This was so much fun to make ... I had ALL the ingredients needed without going out to add to my already bulging stash of stamps, paper, embelishments. I love the way it turned out with all the just right layout (thank you, Kristine). I hope you like it, too! Come see me again. This is so "cutie cute"! Nice posting at blog spot blog i like to do commenting here. Aw, this was a very nice post. In idea I wish to put in writing like this additionally – taking time and actual effort to make an excellent article… however what can I say… I procrastinate alot and not at all appear to get one thing done.